It was not snowboarder Jasey-Jay Anderson's plan to make history at the Olympics _ even though he did, simply by lining up Saturday. He is here seeking information. The Canadian, who won the 2010 gold medal in parallel giant slalom, is the only snowboarder to line up in all six Olympics since the sport was brought to the games in 1998. He finished 24th on Saturday and didn't advance to the medal round,. The result, to him, was only incidental. Now an old man in a young man's game, the 42-year-old Anderson has been running a snowboard-making business since 2010. He briefly retired after his gold-medal win due to a herniated disc. But the injury healed, and Anderson got back into the competitive part of the sport because he realized there was only one way to see if what he's building is really working: By racing. 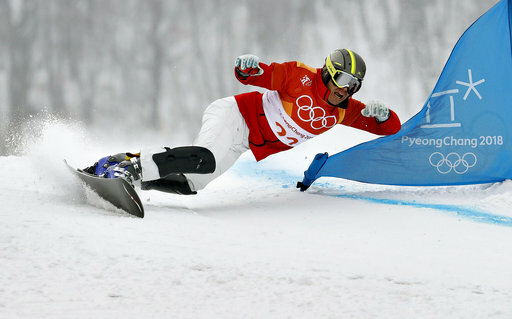 Anderson won the 2010 Olympics on a rain-soaked day in Cypress Mountain outside of Vancouver. The lasting moment from that day was the picture of him with his daughters, Jora and Jy, on his lap, admiring his gold medal. They are now 11 and 12. That picture is in his parents' house. Meanwhile, Anderson spends up to 16 hours a day at his shop in Mont Tremblant trying to make the perfect snowboard. His business, Jasey-Jay Snowboards, sells about 60 percent of what he makes, while the other 40 percent of the boards are used for his own R&D. He thought he had the perfect board for Pyeongchang, but the conditions weren't exactly what he expected and his two runs were not good enough to give him more of what he came here for _ trips down the mountain for more feedback. He says he'll probably keep racing next season. Could he become snowboarding's first seven-time Olympian?